Macaws – the set-up is brilliant and observing these colourful birds (who gave us an excellent performance) from the viewing platform is superb – 10/10. Guide – Marco (we had very limited exposure to him – Charles accompanied us to the Macaw Sinkhole; Marco was with us in the afternoon and on the next morning, and in the afternoon Lucy took over. We had met her at Wolf Camp, where she guided two couples from the U.S. and at the Jaguar Flotel. She is an excellent guide, and we can only recommend her highly – 10/10. Ant Eaters – area beautiful and we enjoyed the scenery – 10/10. Guide – Lucy (see above). We also have to mention the excellent driver/spotter, Marco Fernandez – 10/10. Photography – excellent – 10/10. Prices are per person based on two people sharing a guest room. See inclusions. Macaw Sinkhole (Buraco das Araras). Day 1: Cuiabá (or other) – Campo Grande – Jardim. Arrival in Campo Grande, in Brazil’s southern Pantanal, at 6 pm. Your guide and driver will meet you for the transfer by private car to your hotel in Jardim. Dinner on your own. Overnight in the Hotel Vitória – Double Room. No meals. Day 2: Jardim (Macaw Sinkhole). Breakfast. 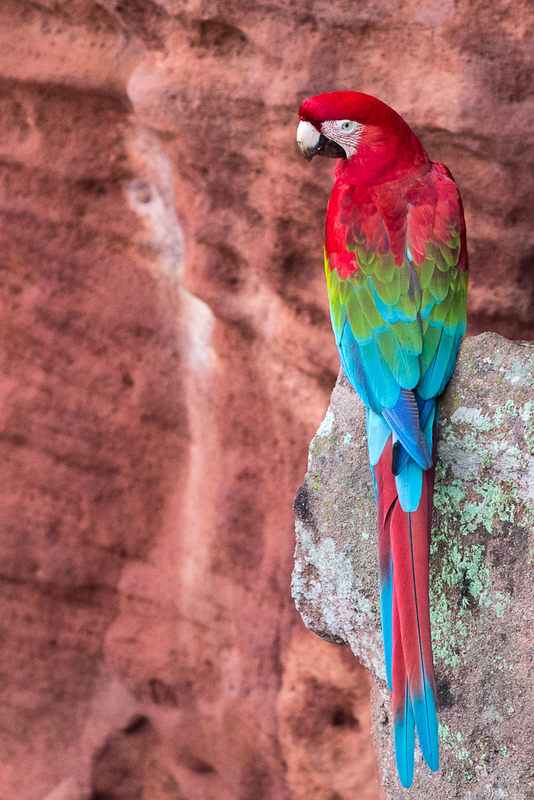 In Jardim, a vast sinkhole falls precipitously into the Earth, holding within it a galaxy of Red-and-Green Macaws that live in the cavities of the pink sandstone walls. This morning, a long visit to the Macaw Sinkhole, or Buraco das Araras as it is called in Portuguese (7 am to 10:45 am). The car is available for your use all day. Lunch near the Sinkhole. In the afternoon, another long visit to this natural phenomenon (2 to 5:30 pm). Dinner on your own. Overnight in the Hotel Vitória – Double Room. B, L.
Day 3: Jardim (Balneário Municipal de Jardim)– Aquidauana (Pousada Aguapé). Breakfast. Another Macaw Sinkhole visit or an early morning visit to the Balneário Municipal de Jardim to marvel at the habituated White-lipped Peccaries, the very habituated Bare-faced Curassows and habituated Brown Capuchin Monkeys (7 am to 8:30 am). 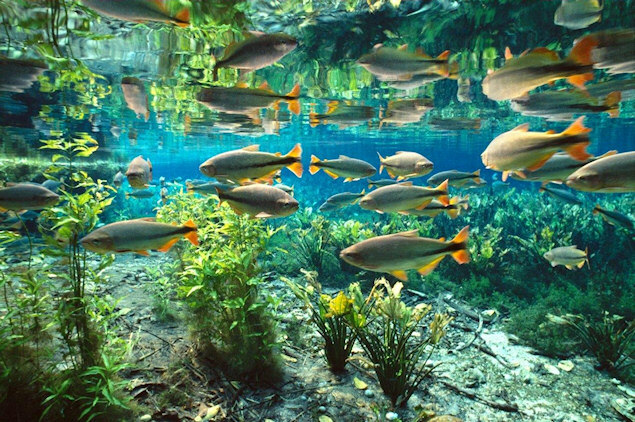 The crystalline waters of the Río da Prata abound with colorful fish, creating a remarkable snorkeling experience. Snorkel at the nearby Recanto Ecológico Río da Prata from 9 am to 12 pm. Lunch. Transfer with your guide by private car to Pousada Aguapé, a typical Pantanal farm, arriving between 4 pm and 4:30 pm. Located in Aquidauana, Aguapé is good for large macaws, Giant Anteaters (early and late in the day) and Ocelots (in the evening). So, search for Giant Anteaters in the late afternoon and search for Ocelots in the evening in the forest near the riverbank. Dinner and overnight in the Pousada Aguapé – Double Room. B, L, D.
Day 4: Aquidauana (Pousada Aguapé). 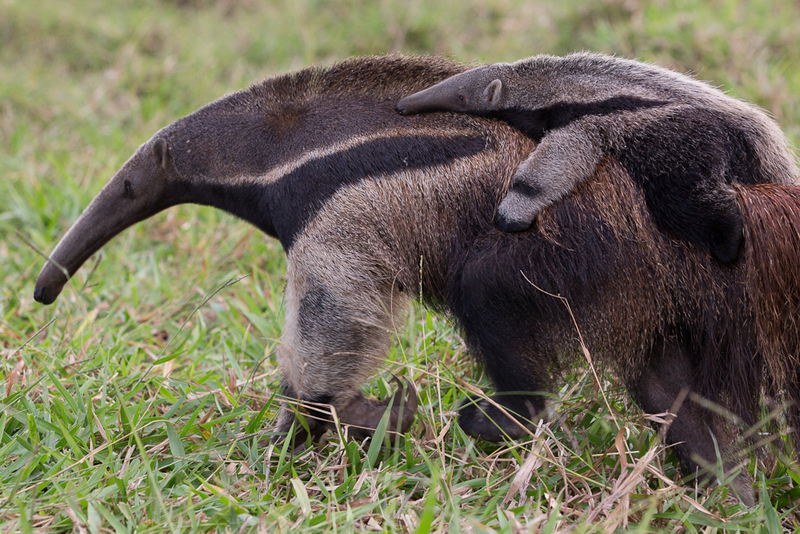 Search for Giant Anteaters from dawn until breakfast time. Breakfast. Embark on a morning outing to search for other fauna. Lunch. Another late afternoon search for Giant Anteaters. 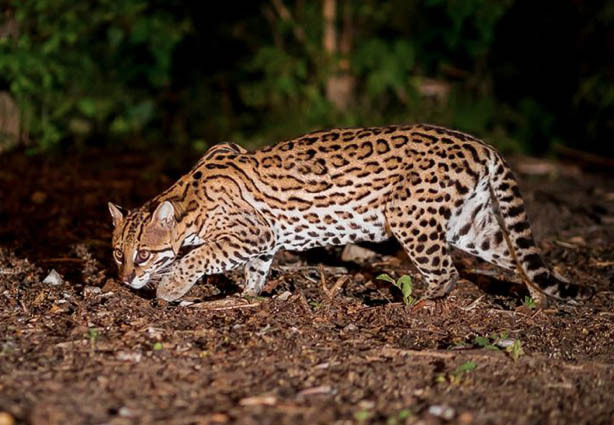 Search for Ocelots in the evening. Dinner and overnight in the Pousada Aguapé – Double Room. B, L, D.
Day 5: Aquidauana (Pousada Aguapé) – Campo Grande – São Paulo. Early morning Giant Anteater search. Breakfast. Final search for fauna near the lodge. 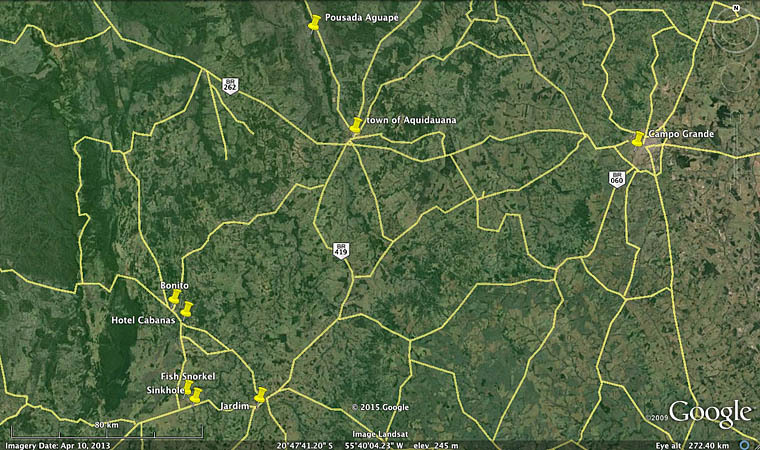 Check out and drive to Campo Grande. Lunch not included, but guests can choose where to lunch en route to the airport for their mid afternoon or late afternoon flight to São Paulo. B. Photography: Recanto Ecológico Río da Prata. The price includes escorted transfers, private excursions (with a naturalist guide, car and driver), entrance fees, specified accommodations, specified meals, as well as all land and water transportation. All prices are per person based on two people sharing a guest room. Travel insurance is not included, and there are no refunds. Therefore, we strongly recommend that you purchase travel insurance by Travel Guard to protect yourself and your investment in the tour. The price excludes passorts and visas, tips, any flights, airport departure taxes, drinks, alcoholic beverages, meals other than specified in the itinerary, personal expenses for extra services (such as laundry and phone calls), optional activities, changes in your itinerary for reasons beyond our control and any other item not mentioned as being included. Air flights are not included. We recommend booking the intra-tour flights through your international carrier or Expedia. A passport valid for six months from your date of entry is required to enter Brazil. It is important to note that a visa may be required. Please check with the nearest Brazilian Consulate as soon as possible. Requirements and costs vary by country. For those traveling on a U.S. passport, a visa is required at a cost of $160 per person. No vaccinations or prophylactic treatments are required or recommended. Take an ample supply of your medications with you and your doctor’s prescription for each, in case you need refills. Further health information for travelers is available from the Centers for Disease Control. Jardim and Aquidauana, Southern Pantanal, Brazil.